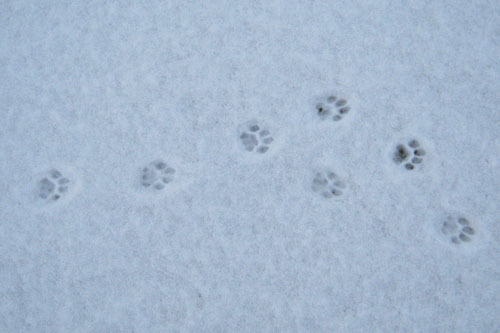 If the pungent stench hadn’t first assaulted my senses, the tiny footprints in the remnants of snow on my deck would have led me to believe that a small feline intruder had been in my entrance way and left its fluidic calling card. I am no stranger to the repugnant smell of cat pee. I have suffered before and was doing it again as the essence of the foul beast breached the sanctity of my nasal passages and made its way into my throat. Before my morning vision had even the slightest chance of coming into focus the very solemnity of my home, as well as my olfactory nerves, had been violated by my neighbor’s cat. Now, before you judge me on the basis of these words, I do not dislike cats. I appreciate their ability to be detached yet affectionate. I admire their commitment to their sense of self. And I applaud their propensity to be indifferent and intrigued at the same time. That being said, I do take offence to a four-legged creature of the non-canine variety befouling a room in which it has no business being present. Cats do not, and will not, live in my home. Allergic reactions aside, I have a colored past with these anciently domesticated beings and, in putting my differences aside, I have come to the realization that we make better strangers than friends. I have repeatedly admonished my dog for wanting to run into the neighbor’s yard when she sees this territorial interloper, but I have since rethought my initial position. My dog is merely protecting the rightful place that is her shelter. She is simply defending her home against enemies, feral or domestic. And she is attempting to preserve my nose from the offensive fragrance of future feline fearlessness. Lol – I may adopt that theory! I have my own ongoing feud with neighborhood feral cats so I feel your pain. Since I do not have a dog I must chase them myself while the squirrels in the branches above hoot and cheer. Now that is an image I needed on this Monday! The squirrels need it too, apparently!